Handcrafted in California, an exquisite heritage brand powered by innovation, Tacori is one of the true jewels of West Coast design. Tacori wedding bands are sourced from the finest precious metals and feature diamonds masterfully-set by trained artisans. The women’s wedding bands showcased by Albert’s Diamond Jewelers feature iconic geometric designs, while the men’s wedding bands blend a masculine sense of solidity and texture to create a wedding band that truly captures the imagination. Whether you’re the bride-to-be or a proud fiancé, a Tacori wedding band is the right choice to commemorate your happiest day for the rest of your life. The Classic Crescent and Sculpted Crescent bands from Tacori are the perfect choice for the bride who want a carved, aesthetic look for their wedding bands. The Classic Crescent collection features a vintage, milgrain look, set delightfully in rich platinum, and the women’s Sculpted Crescent collection’s lovely 18k white gold band contains pave-set diamonds that circle a bride’s finger in an eternity-style continuity. Also, don’t overlook the Petite Crescent collection, whose showcase piece features round-cut diamonds set in 18k white gold petals—the ideal choice for a bride who wants her band to outshine the roses at her wedding. For a man who wants his wedding band to match his blushing bride’s, the men’s Sculpted Crescent collection also contains a stunning example of vintage tastes meeting modern design. 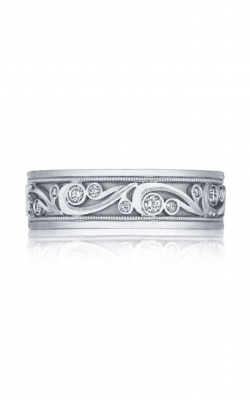 The regal 18k white gold paisley curves are elegantly set with 0.44 carats of bezel-set diamonds. The women’s RoyalT and Simply Tacori collections put a spotlight on the treasure-trove of diamonds used in their design. There’s nothing simple about the Simply Tacori collection’s use of diamonds in channel and pave-set bands, and the RoyalT collection features regal platinum bands that contain up to 1.5 carats of fiery white diamonds fit for a queen. 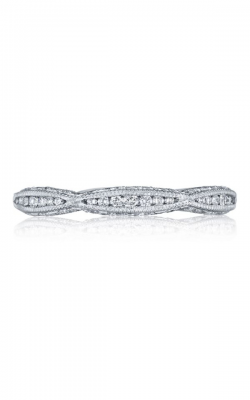 Why Shop for Tacori Wedding Bands at Albert’s Diamond Jewelers? Albert’s Diamond Jewelers is Northwest Indiana’s authorized Tacori Gold Dealer. This means that you can always be assured that your visit to the Schererville or Merrillville, Indiana showrooms of Albert’s Diamond Jewelers will provide you with the Tacori wedding band of your dreams. Additionally, Albert’s Diamond Jewelers offers a wide variety of services that keep your new Tacori wedding band in perfect conditions for decades to come, including cleaning and refinishing, as well as sizing and repair.